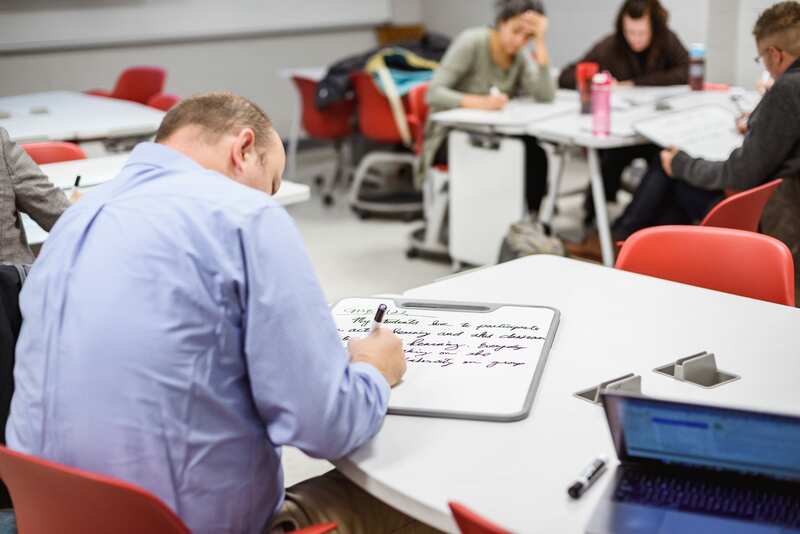 There are a variety of ways that instructors can leverage white board surfaces to support active learning and student engagement. Today’s post will focus on using Verb boards for both individual and collaborative work. Verb boards featured in Geology (GY) 436 on the Bloomington campus. Verb boards: Verb boards are small, portable dry-erase boards that give students a space to write, draw, and calculate. In other words, it’s a flexible platform students can use share their work with their classmates. Instructors can use Verb boards to engage your students in conversation and as a way of confirming their understanding of key course concepts. Verb boards also provide a way for quieter students to engage in class discussion. Today we will share one activity that leverages Verb boards to encourage individual reflection and whole class conversation and feedback. At a recent Mosaic Fellows meeting on the Bloomington campus, we invited Julie Johnston, Director of Learning Spaces in UITS Learning Technologies, to share updates on current space design projects across IU and to hear faculty ideas regarding learning spaces. To best facilitate this sharing of faculty ideas, our goal was to engage in a larger conversation based on the input of each individual participant. To begin, we asked each Mosaic Fellow to write on a Verb board their response to the following prompt: What Does the Learning Spaces Director need to know (from faculty) about learning spaces across the IUB campus? Faculty were given five minutes to write their responses on the Verb boards. This initial, individual reflection was important: before engaging in a group conversation, we wanted to give each Fellow an opportunity to respond to the prompt as informed by their own discipline and teaching experiences. Next, we asked each Fellow to hang up their individual boards so that each individual response was visible; this side-by-side placement of boards made it easy to compare and contrast responses. We then asked all the Fellows to walk up to the boards and read the individual responses. Gathered around the boards, the Fellows naturally began to talk to one another and began to discuss common themes and ideas expressed across the individual responses. Finally, we asked the Fellows to share with our Learning Spaces Director what they thought were the key ideas expressed across the responses. Not surprisingly, discussing what the Fellows wrote down with the original prompt generated more ideas than originally expressed on the boards, which highlighted the importance of that initial five-minute reflection time, i.e., thoughtful, informed individual responses provided the framework for productive group conversation. Utilizing the Verb boards, we achieved our goal of sharing with our Learning Spaces Director faculty perspectives on Learning Spaces. The boards gave each individual Fellow a means to share their own thoughts while providing an opportunity for the entire group to engage one another. How are you using Verb boards in your classes? Share your ideas in the comments below, or contact us to write a blog. Completely spam free, opt out any time. Mosaic blogs delivered directly to you! Become a Mosaic Fellow: 2019 – 2010!